ANSWER this question for me: Answer me this...what exactly qualifies a dish as a casserole?? Inquiring mines want to know!!! 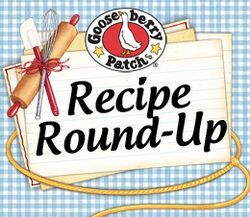 This Round-up is with Gooseberry Patch! They are sharing a recipe below! Link up or do the blog hop and check out the recipes! we're rounding up CASSEROLES this week! Have a great one to share? We'd love for you to link up below. it's our Cookbook of the Week! Shared by Tiffani Schulte from Wyandotte, Michigan, this casserole is one your family is sure to request again and again! In a small bowl, combine sugar and egg. In a separate bowl, combine flour, baking powder and salt. Add flour mixture to sugar mixture. Add cornmeal, butter and milk, stirring just to combine. Stir in hot dogs. Pour into a well-greased 8"x8" baking pan. Bake, uncovered, at 375 degrees for about 15 minutes, or until a toothpick inserted in the center comes out clean. Serves 6.
by using our handy button below.